The north end of what I am tempted to call the Oak Street Esplanade starts on 30th Avenue. 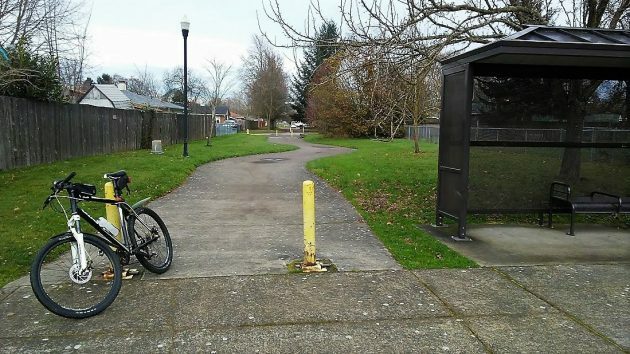 On a leisurely ride through South Albany this week, I came across a feature in the urban landscape I can’t remember seeing before. It’s this broad swath of parkland the width of a street and four blocks long, with a concrete path winding down the middle for walking or riding a bike. It’s not a park, though. 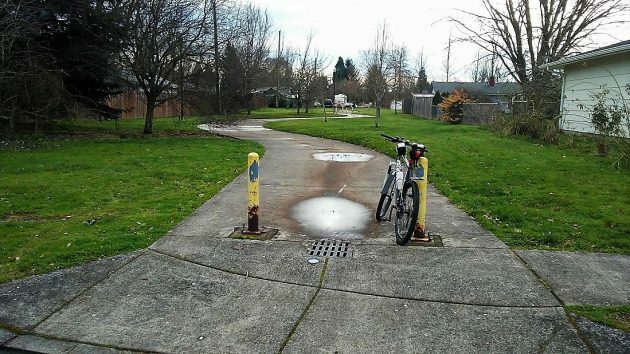 It is, in fact, the right-of-way of Oak Street, one of the north-south streets that starts on the Willamette River and runs all the way south to the Albany-Santiam Canal. But in between 30th and 34th avenues, there was no street when nearby houses were built starting in the 1950s and ’60s. The cross streets, 32nd and 33rd avenues, ended in cul-de-sacs too narrow for trucks to turn around. So in 2002 or thereabouts, as part of a voter-approved, bond-funded project to improve 34th Avenue, the city did something which now seems ingenious, though at the time I paid no attention to it. It built this unconventional connection from 30th to 34th, along with lighting and landscaping along the path to make the route attractive and comfortable to users. At the same time the city had turn-arounds constructed at the ends of 32nd and 33rd. All this I learned when I inquired at City Hall. Ron Irish’s title there is transportation systems analyst, but he’s also the city’s street historian who remembers — or can look up — what was done when, where and why. In the case of the Oak Street — what shall we call it? “Esplanade” maybe? — it was built because this solution was less expensive than a full street extension. And the cul-de-sac bulbs allow for standard vehicles to turn around at the end of 32nd and 33rd without using people’s driveways. Also, the concrete path was designed to allow fire trucks to get out of those dead-end streets without having to back up all the way to Tudor Way. And the path gave residents on several streets easy access to a bus stop, new at the time, on 34th Avenue. When I rode down that path and back up the other day, there was nobody around. The grassy areas looked well kept up, and I saw no trash. I thought perhaps the neighbors were taking care of this, and if they are, more power to them. The path itself and the lighting, I learned at City Hall, are maintained by Public Works. And this is the south end, at the bus stop on 34th Avenue. Hasso, you’ve talked to Ron Irish WAY more than a few times, and I bet we could agree that Ron is one of the great public servants. He is a person dedicated to doing the job right, the first time,and with care. A lot more of the world could look like this if city designers (and their customers) got unstuck from cars-upfront-everywhere thinking. Half the streets in Albany and Corvallis could have been like this instead of vast, unneeded asphalt expanses. One possibility is houses fronting on an esplanade with car access by back alley. “… less expensive than a full street extension …” Of course. Also, far less impervious surface, to which city governments pay a lot of lip service. Rain Tax, anyone? “The grassy areas looked well kept up…” The photo from 30th doesn’t show it, but on the cul-de-sacs there are houses for which the esplanade is almost a front yard. This might foster a sense of “ownership” over the area – more than toward a regular street or a back-pathway isolated by walls or fences.